Contrary to what my old sales manager used to say, apparently the numbers do lie. 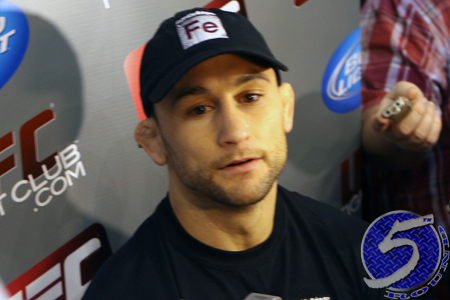 Despite landing 66 significant strikes to Benson Henderson’s 62, and tallying 70 total strikes compared to Bendo’s 65, Frankie Edgar (Pictured) still left Denver without the UFC lightweight title. According to FightMetric, the hotly contested rematch between the 155-pounders should have resulted in a 48-48 draw, instead of a (46-49, 48-47, 48-47) split decision victory for Henderson. Judges Mark Van Tine and Dave Hagan gave the first, third and fourth rounds to Henderson, while Tony Weeks awarded Edgar with every round but the opener. That means the only frames up for debate are the third and fourth. Based on what the UFC’s official number crunchers gathered, Edgar connected on more strikes, as well as significant strikes in the middle stanza (15 to 13 in both categories). However, they each had 17 total strikes in the fourth, but Henderson landed 17 significant strikes to Edgar’s 15. No matter who you felt should have gotten their hand raised, the only numbers that matter are 0-2. That is now Edgar’s record against Henderson. UFC 150 took place Saturday inside Pepsi Center in Colorado.